Raw material : Raw material used in our products is food grade, UV stabilized, anti-microbial, anti-static, recyclable, and 100% LLD polyethylene. Resistance : Resistant to sun beams and impact. Color : Our tanks are white and blue colored, blue colored tanks won't moss. Dimensions of the body : Product dimensions have ± (3%) tolerance. Body : Products are manufactured as a single piece (mono-block), there is no any attachment or fastener. Conformity : Our polyethylene tanks are conformable with food substances regulations. 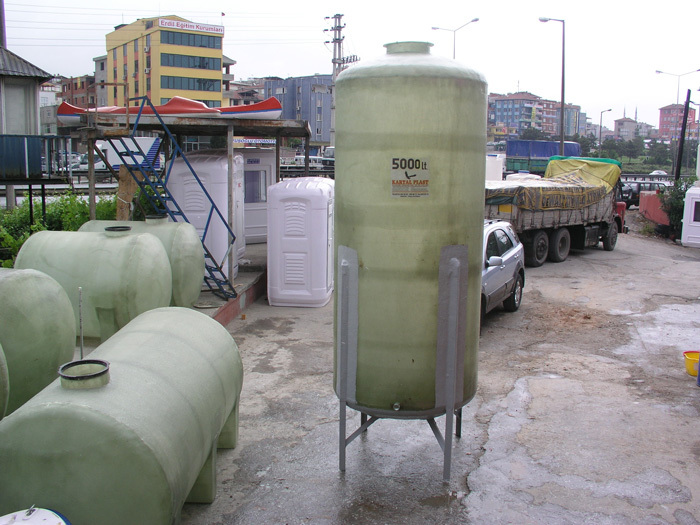 Chemicals : Our tanks can be manufactured as gasoline and diesel tank with 30% raw material change, transportation tank with 40% raw material change, acid tank with 30-100% raw material difference. Maintenance : Our products are long-life, healthy, maintenance free, and can easily be cleaned with water. Transportation : It can easily be transported and isn't damage during transportation. Recycling : Our polyethylene products can be recycled. Sleeve : It can easily be mounted brass or plastic sleeve on any location of the tank. Warranty : All our products are guaranteed against all manufacturing faults. Fault : It is possible to repair against misuse. Chemicals : It is resistant up to 65˚C. 15.000 Liter Industrial Water .